For one of the Almanacs in 2009, I was asked to provide a couple of recipes. Nothing really magical about them, other than the two months assigned to me were in winter. I decided that one needed to be something New Englanders found essential for winter - soup. While I do not cook much, I do love a good home made soup. Chicken Barley soup is a favorite of mine as it can be stuffed in the crock pot and left to simmer most of the day, to be enjoyed at the end of a cold fall day. I use any kind of poultry, so turkey this recipe is also good for left over chicken. And stick some of that left over stuffing in to thicken it up. The other recipe was to bring the memories of summer into the coldest of winter. I call it Tomato Delight, some call it Bruschetta. We make it with fresh tomatoes and basil from the garden in the summer. The wonderful thing about living in this day and age is the supermarkets always seem to have fresh veggies all year round. So, when it is coldest outside, starting a meal off with a summer dish warms up the soul. Think about how winter, which can sometimes seem very brutal and never ending, can be forgotten for a bit just by a little comfort food or a reminder of spring. My favorite magical comfort food is chicken barley soup. The soup is light but filling and goes well with buttered crusty bread. Make this with fresh carrots, celery, onions and chicken; it is a great late fall, early winter meal. The barley adds a great flavor to the soup and it is a great warm up meal! 1 chicken – I use a small whole chicken. If you are looking to cut down on calories, then I suggest you use chicken parts with the skin removed. Chicken breast works well. 1 large onion – if you like onion just chop it up. If you are not a big fan of onions, cut the onions into quarters to be removed later. Start this in the early afternoon. In a large slow cooker on high, place barley, chicken, chopped carrots, chopped celery and onion. Cover with water, stir occasionally and add water to keep chicken covered. Let cook till chicken starts to falls off the bone and barley is soft. This can be as much as two to two and one-half hours depending on the size of your chicken and cooker and the heat range of the cooker. Smaller pots and chicken will require less time. When the chicken is done, remove the onion if you don't want it in the soup. Remove the chicken, allow to cool somewhat, remove the meat from the bones and return meat to pot. Add the basil, sage, salt and pepper to taste. Allow to sit on simmer, stirring occasionally, till everyone gets home. Serve with crusty bread and butter. Store left over soup in a covered container in refrigerator and enjoy the rest of the week. Can make up to 5 servings. Winter sets in and we remember the summer when we had fresh vegetables and salads on our plates. 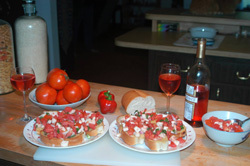 I love tomatoes fresh from the garden and topped with fresh basil on crusty bread is one of my favorites. With winter it may be harder to find fresh tomatoes but if I am at the grocery and find some fresh on the vine tomatoes, I can't resist picking them up and taking them home. Try this quick appetizer. Use tomatoes on the vine that smell like tomatoes. Don't use the pre-packaged ones. Use your nose to tell you they are fresh, ripe tomatoes. They are even better if you get them from the organic section of the grocery. You also want fresh mozzarella. I like the soft, packed whole milk mozzarella in water, not the part skimmed product that is dry and hard. Fresh mozzarella should be soft, creamy and sweet. You will also need sweet basil. Sometimes you can find bunches of fresh basil in the stores. Otherwise, use the dried variety. You will finish this dish with toasted crusty Italian bread and extra virgin olive oil – slightly warm is best. Slice the tops off the tomatoes, and slice the cheese. Chop up the leaves of basil if you have fresh or just sprinkle the tomatoes with basil and then top with the sliced cheese. Sit them on a baking pan. Place in the middle of the oven with the broiler on till the cheese browns, not more than 15 or 20 minutes. Do not place directly under the flame or the cheese will burn. Cut up the tomatoes with the browned cheese and serve with the toasted bread. Dip the bread in the warm olive oil and scoop up the tomato/cheese mix. A magical summer moment in the middle of winter!